Last summer, Fox News anchor Bill O’Reilly came to believe that his wife was romantically involved with another man. Not just any man, but a police detective in the Long Island community they call home. So O’Reilly did what any concerned husband would do: He pulled strings to get the police department’s internal affairs unit to investigate one of their own for messing with the wrong man’s lady. Roger Ailes—treating his local police department like a private security force and trying to damage one cop’s career for the sin of crossing Bill O’Reilly. The article goes on with the details from the Nassau County Police Department. Just like Rush Limbaugh and his drug problem as well as Donald Trump and his spoiled treatment on the part of his dad (as he then goes on to question Barack Obama’s education credentials and if he is worthy to be out POTUS), we now have O’Reilly who talks big talk, calls people pin heads, and does his best to be the conservative champ in terms of moral righteousness. I wonder how he will spin this on his show. Victimization possibly? Considering Perry has just jumped into the GOP race, may be the front-runner without involving himself in the Iowa straw poll, and has a good chance at this point of being a front-runner in his parties nomination race, it’s worth following him. Here comes George Bush III. Wyoming Corporate Services, a company which helped over 2,000 other companies incorporate themselves in a small brick house in Cheyenne Wyoming. 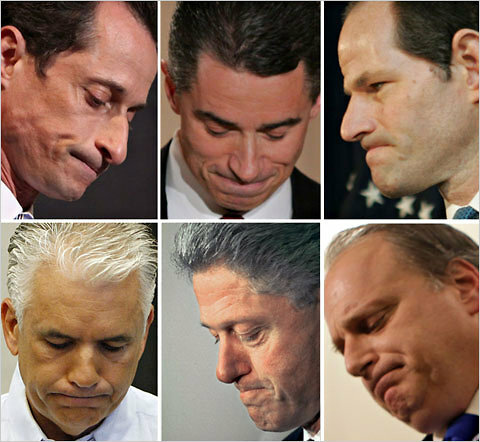 Pictured clockwise from top left, Representative Anthony Weiner of New York, former Gov. James McGreevey of New Jersey, former Gov. Eliot Spitzer of New York, former Representative Eric J. Massa of New York, President Bill Clinton and former Senator John Ensign of Nevada. Politician after politician, in scandal after scandal, faces the cameras with his lips pursed and pulled tight, narrowing them. The chin boss — the fleshy bump above the chin bone — is pushed upward, pulling the lips into an upside-down smile. Add a downward-cast gaze, perhaps a shake of the head, and: Instant Disgraced Pol. The impoverishment of farmers in Colombia and Afghanistan, drug cartels undermining democracy in multiple South and Central American countries, tens of thousands dead in Mexico, violent drug gangs on the streets of America, millions of non-violent offenders in US prisons — these are just some of the actual consequences of the black market in narcotics, and if prohibitionists actually confronted the moral destruction caused by their policies, they wouldn’t need Gary Johnson, the Global Commission on Drug Policy, or anyone else to persuade them that by defending the status quo they do harm. Gary Johnson’s comments on the Hannity show are helpful in this conversation. The first point is a horse beaten to death. Get your fill in the “sermon” by Tim Pawlenty above. As for the second point, this deals not with politics but with agricultural work. I read this article in a different lens after working on the farm the past week. I have grown up working hard with my dad (who has been a landscaper for 30 years), with my Boy Scout troop creating 13+ feet high campfires and completing maintenance tasks, and now pulling out malta flora rose bushes that are entangled with vines overgrown for the past 10 years. Lofgren said farmers are worried that their work force is about to disappear. They say they want to hire legal workers and U.S. citizens, but that it’s nearly impossible, given the relatively low wages and back-breaking work. Arturo S. Rodriguez, president of United Farm Workers, said migrant farm workers are exposed to blistering heat with little or no shade and few water breaks. It’s skilled work, he said, requiring produce pickers to be exact and quick. While the best mushroom pickers can earn about $35,000 to $40,000 a year for piece work, there’s little chance for a good living and American workers don’t seem interested in farm jobs. “It is extremely difficult, hard, dangerous work,” Rodriguez said. Last year Rodriguez’s group started the “Take Our Jobs” campaign to entice American workers to take the fields. He said of about 86,000 inquiries the group got about the offer, only 11 workers took jobs. “That really was thought up by farm workers trying to figure out what is it we needed to do to show that we are not trying to take away anyone’s job,” Rodriguez said. Several times in those sections Americans are hinted to be unwilling to take some of these available jobs. If such a glaring gap in inquiry and taking a job (86,000 inquiries the group got about the offer, only 11 workers took jobs) is present, can anyone then blame the President and the crummy economy and not their own unemployed self? Straying away from open jobs has pushed our country to strongly desire comfy, cozy work and benefits that are unsustainable in the long term.Yes, this may be a larger problem in the educational sector than many other jobs, but much of our IT work has too been outsourced. America the great. America the exceptional. Figure this out (along with our huge prison issue) or continue to sound hypocritical. Above, Major Neil Franklin, a retired Police Officer, speaks at Riverside Church in Harlem (NYC) on the impacts the war on drugs has on people of color. Miami police officers caught people taping them recklessly shoot up a car and took their phones and broke them on the ground. A slew of celebs are petitioning the United Nations to end the war on drugs. In the twenty-seven nations of the European Union, whose combined population exceeds ours by nearly two hundred million, the total prison population for all crimes combined is around six hundred thousand. In the US, we’ve got almost that number of people – five hundred thousand to be precise — in prison for drug related crimes alone. And many of these crimes involve no violence whatsoever. African Americans make up roughly twelve percent of our total population, but they make up over forty percent of the prison population. Latinos make up thirteen percent of the population, but twenty percent of prison inmates. The prison system is one of the epicenters of racial inequality in America. If current trends continue, one-third of all black males and one-sixth of all Latino males will go to prison during their lives, as opposed to one in seventeen white males. As easy as it is to say “fix the broken system!” it is harder than many can fathom. Just spending one day in an in-school suspension room at a middle school will give you a taste of what reformers are up against. We cannot talk to these detained students, yet (healthy) attention is most likely just what they need. We cannot really help them with their work and are to encourage them to figure it out on their own (because they ruined their chance in class to be taught), yet patient help is what they do need. This may take me off of the original topic, but it has me questioning aspects of the public school system (which I have been for a few months). The system is very much assembly-line-esque with almost a one size fits all approach. The outlier pupils – most notably those who cannot sit still due to ADHD, anxiety, etc. – are disciplined. From my first hand experience, the students I had who exhibited ADHD or anxiety symptoms had issues stemming from their parents (or lack of parental presence). Some of these students became hyper-active due to these home issues and others reticent to the point that I unfortunately might not even notice them on a day to day basis. I hope this all can emphasize a few things. One, family (supportive, loving, present, active) really does matter. Two, support systems (teachers, tutors, clubs, teams, religious institutions, et al) are strong supplemental systems that in some cases are even the primary support for our younger generation. Third and finally, having the first and second aforementioned points as positive presences in a students life are just what they (and we all) need to move along through the ups and downs in life (whether through discipline issues at school, a lost job, or a string of incarcerations). Metaphors and imagery can be great tools for communicating. They also can be abused by pundits and invective slingers. Here is a stunning story on this when related to crime. A study: “the researchers asked 482 students to read one of two reports about crime in the City of Addison. Later, they had to suggest solutions for the problem. In the first report, crime was described as a “wild beast preying on the city” and “lurking in neighborhoods”. After reading these words, 75% of the students put forward solutions that involved enforcement or punishment, such as building more jails or even calling in the military for help. Only 25% suggested social reforms such as fixing the economy, improving education or providing better health care. The second report was exactly the same, except it described crime as a “virus infecting the city” and “plaguing” communities. After reading this version, only 56% opted for great law enforcement, while 44% suggested social reforms. The researchers also discovered that the words themselves do not wield much influence without the right context. When Thibodeau and Boroditsky asked participants to come up with synonyms for either “beast” or “virus”before reading identical crime reports, they provided similar solutions for solving the city’s problems. In other words, the metaphors only worked if they framed the story. If, however, they appeared at the end of the report, they didn’t have any discernable effect. It seems that when it comes to the potency of metaphor, context is king. If the Drug War Killed a U.S. Soldier, Would You Oppose It? As the SWAT team forced its way into his home, [Jose] Guerena, a former Marine who served two tours of duty in Iraq, armed himself with his AR-15 rifle and told his wife and son to hide in a closet. As the officers entered, Guerena confronted them from the far end of a long, dark hallway. The police opened fire, releasing more than 70 rounds in about 7 seconds, at least 60 of which struck Guerena. He was pronounced dead a little over an hour later. The Pima County Sheriff’s Department initially claimed (PDF) Guerena fired his weapon at the SWAT team. They now acknowledge that not only did he not fire, the safety on his gun was still activated when he was killed. Guerena had no prior criminal record, and the police found nothing illegal in his home. This is insane. Herman Cain offers no clear, original, or seemingly plausible solutions to this war. Are there any? “Do this research if we don’t have a season — watch how much evil, which we call crime — watch how much crime picks up if you take away our game,” Ray Lewis, NFL football player for the Baltimore Ravens, when thinking about the implications of a lockout. The California Supreme Court upheld a decision to release 30,000 inmates. Conor Friedersdorf and Mark Kleiman are hoping they use the GPS-type trackers for these released offenders. In a way, this is contrary to the vibe the Tea Party has given off. It’s been insinuated that they have been so fed up with the government and many other issues plaguing whites over 45 that they are bound to storm Washington and “take matters into their own hands”. A scientific take on this topic here. A 20+ year cold case is followed up on and will keep you on the edge of your seat.